It was far too nice a day to spend indoors. After church I put on my hiking boots, we grabbed a water bottle and few snacks and off we went. As we walked we discussed the meaning of the word "bight." He was right; I was wrong. A bight is a geographical term for a "slight bend or recess in a coastline or river. It typically indicates a large, open bay, often only slightly receding." Once we reached the water, we tried taking some photos with the delayed timer. I pushed the button, clambered down some rocks and up some more, trying to get to Tim's side within the 10 seconds. I've shared a couple of the attempts in the collage. We moved to an easier access point before claiming success. It's high time to investigate a remote! Such a pretty day. In the forest, we stood still and heard fir needles dropping like soft rain. A leaf let go and sashayed downwards, rustling when it touched a branch. There is still much green in the woods, and a definite feel of autumn crispness in the air. This is the kind of day that I wish would go on and on. As Anne of Green Gables says, "I'm so glad I live in a world where there are Octobers." You did pretty well with the timed camera, especially having to scramble up rocks. Our weather has turned to fall and it would be nice if it lasted a long while. Such beautiful days and cool nights! Bight is a new word for me. Oh- those timers!!! LOL We have had our share of fun with those taking family pictures over the years. lol We have not had much of a fall here. Not even all of our leaves are changed yet---and usually by now our trees are bare. Such an odd year. Beautiful photos! I like the ones of you especially! 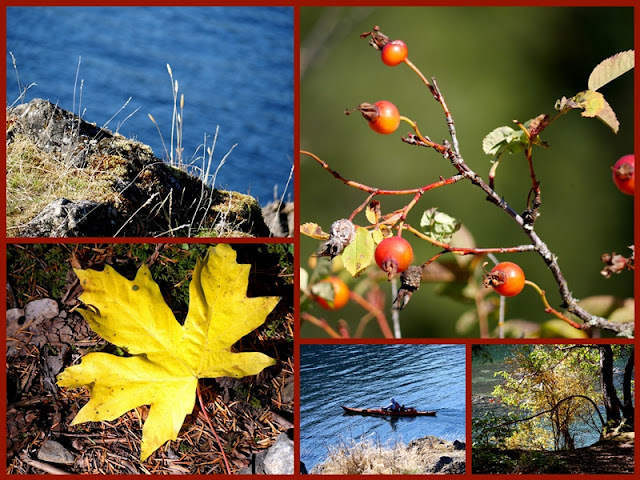 If all October days were as lovely as yours in this post we'd be well set up for winter! Weather here in the aouth west of UK is weird going from wet and dismal to bright sunshine and back again but always very warm for the time of year. We are awaiting the arrival of the remnants of Ophelia today so maybe the leaves (and possibly a few trees) will fall then as so far we haven't reay had any proper autumn colours or many leaves falling. I so agree with Ann of GG, I love Octobers and the many different facets of this special month. Right now the sky outside is yellow! I have no idea what is happening to the weather this afternoon but it is looking really weird out there. You've captured Anne's vision of a beautiful October day so beautifully, Lorrie. Thank you! Thanks for introducing "bight" to my vocabulary. Might come in handy during a Scrabble game one day! We've been spoiled with the unseasonably warm temperatures in October. I finally turned the furnace on last night. Lorrie, your words and photos and talent for finding grace and sharing it are balm for the spirit. Thank you! Great place to hike. Very beautiful. You had a most amazing (and perfect) October Day. Beautiful post, photos, vistas... LOVE seeing the photos of you!! You are beautiful, my sweet blog friend. :) Kudos to you for using that timer!! Glad you were able to enjoy a day outdoors as beautiful as this one. Fabulous collage of you trying to get back into the photo within 10 seconds! Sunday was a beautiful day in the Pacific Northwest for sure! The winds are howling now! What a gorgeous place and we all learned what a bight is...you never know when you might need that word. heehee! We look forward to this month for cooling temps too and the chance to get out and hike. We hiked again yesterday....and our highs were only in the 70s! YAY! Beautiful photos. You got a work out for your photos. Hugs! 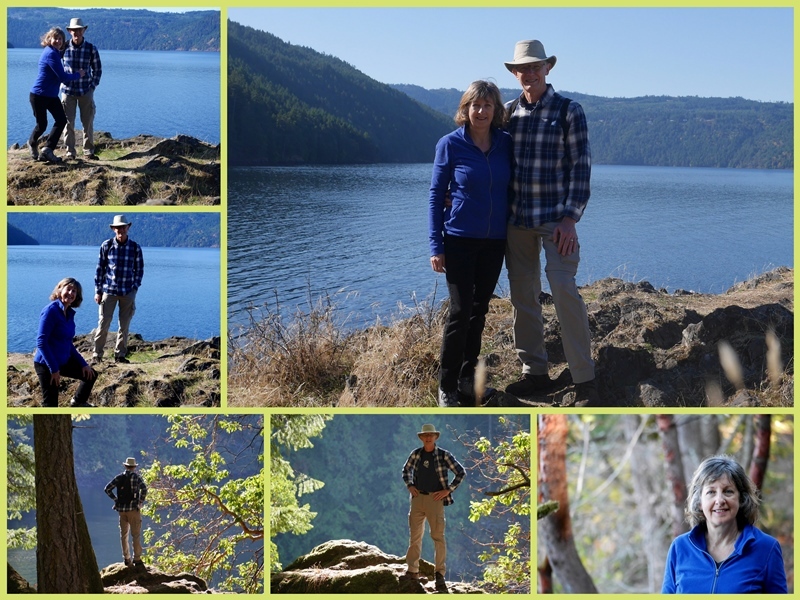 I always love seeing the excursions that you and your hubby take, Lorrie. I also learned a new word...bight! Your photos are fabulous and I also loved your previous post on what should be award winning photography! What a beautiful fall hike. How fun to be figuring out how to take pictures with the remote, good job. Your timer photos made me laugh out loud. My Spousal Unit keeps suggesting to me that every one of my posts should have one part that makes people giggle! And your collage is October on steroids - it captures the sentiment so well.